Its cloud forests are particularly fecund: 14 of the 30 new species of frog discovered were found in a patch of cloud forest just a couple of miles wide. 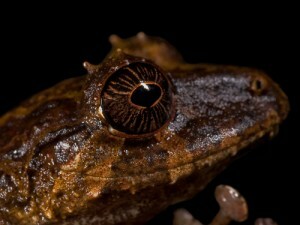 The newly-discovered frogs are “rain” frogs of the genus Pristimantis, which lay their eggs in trees. As the eggs hatch, miniature versions of the adult frogs � some the size of a pinhead � fall into the water below. 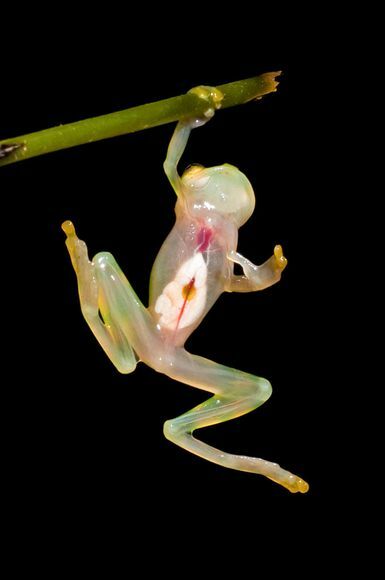 One of the frogs is a so-called glass frog that has a transparent chest. 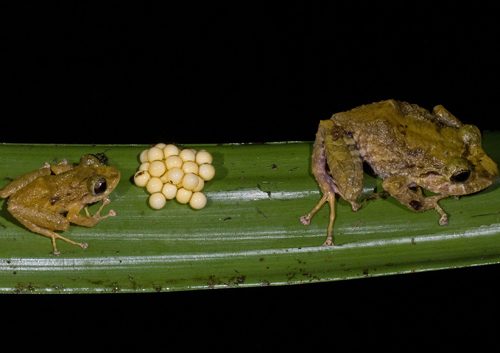 Rain frogs, like these unidentified Pristimantis individuals, of which the expedition may have discovered 30 new species, lay their eggs in trees, instead of in water. When they hatch the young frogs are not tadpoles, but actual mini-versions of adults. The frogs require moist forests in order to breed successfully, researchers fear that climate change could make the forests drier. 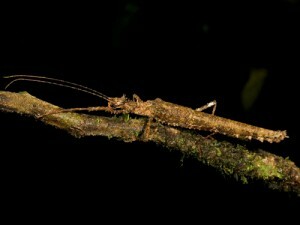 This is a new stick insect, of the genus Xylospinodes.� It was one of four new species of such creatures discovered by the expedition. 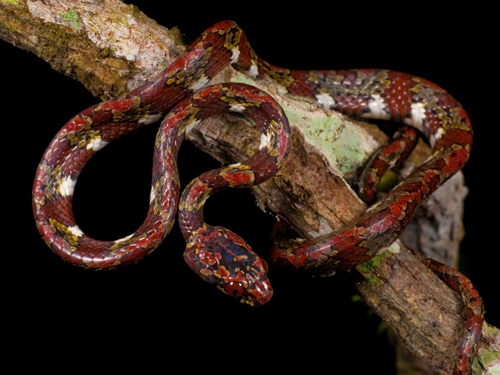 An unidentified snail-sucking snake of the genus Sibon.� The slug-sucking snake, which features a oversized head and red beady eyes, belongs to a small group of serpents that specialise in eating snails and slugs and its closest relative is found nearly 350 miles away in Peru. 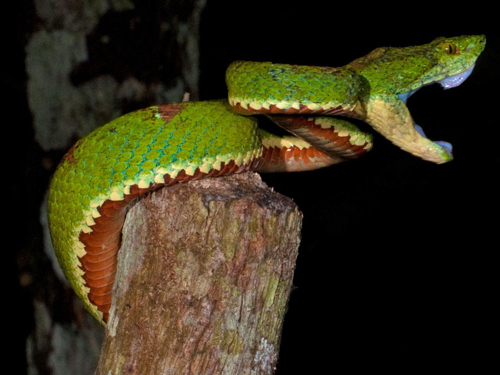 Many snakes of the Ecuadorean forests are threatened by man and one species – the 12ft long bushmaster viper – has been hunted almost to extinction in many parts of its range. A spectacular eyelash viper, Bothriechis schlegelli. 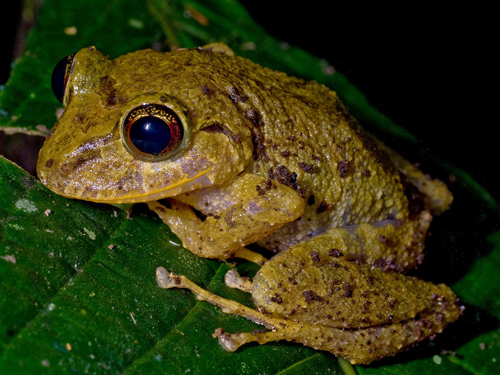 Another unidentified rain frog of the genus Pristimantis. This one is distinguished by a red streak through the iris. This unidentified rain frog of the genus Pristimantis was found in Cerro Pata de P�jaro in western Ecuador. 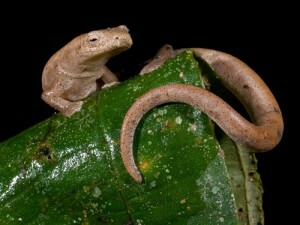 Salamanders of the genus Bolitoglossa lack lungs. Instead, they breathe entirely through their skin.� This one was found in western Ecuador for the first time. 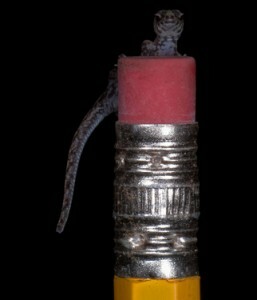 The tiny scaly-eyed gecko, Lepidoblepharis buschwaldii, is one of the smallest geckos known to exist. The Nymphagus Chancas is named for its translucent skin, which allows scientists to examine the frog�s internal organs. 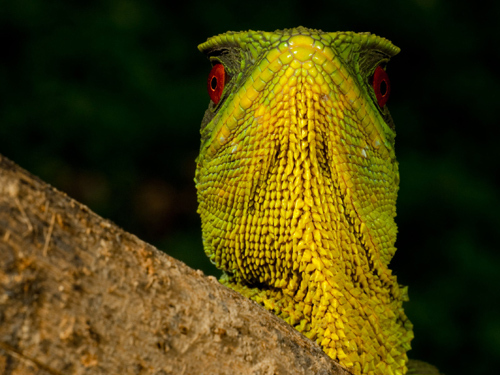 They are classified by their lack of webbing on their outer fingers, their lack of humeral spines in adult males, and their lobbed livers. Their natural habitats are subtropical or tropical montane rivers and forests. 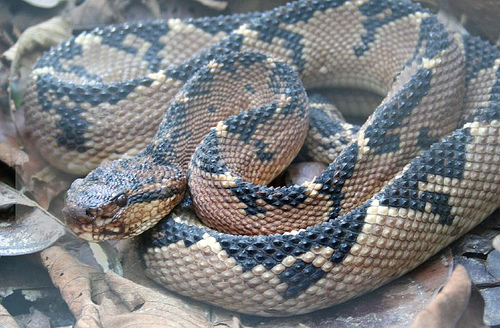 The bushmaster, Lachesis acrochorda, is the longest viper in the world, but rarely seen in its native habitat, a likely consequence persecution by humans. 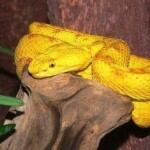 These highly poisonous snakes can regularly exceed 6.5 ft in length, with one of the largest recorded at 14 ft.